UNICEF and major water and housing equipment maker Lixil Corp. announced on Thursday that they forged a partnership to address sanitation problems that put hundreds of children in danger every day. Lixil President Kinya Seto said the agreement would be a boon for children. “Having a partnership with UNICEF will improve our ability a million times over. UNICEF has credibility and a network we can’t match, and that means we will be able to deliver toilets to children much more quickly than was possible before,” he told a news conference in Setagaya Ward, Tokyo. Lixil has already taken the lead in providing affordable and clean toilets to developing countries, having put in place 1.2 million affordable plastic “safe toilets” dubbed SATO in developing countries through direct sales and donations from citizens’ groups and foundations. Hiroto Izumi, a special adviser to the prime minister, said there was a greater need for products like Lixil’s. “There are incredibly expensive and high-end toilets in Japan, and while it is good to produce such toilets, I wish more companies would create toilets like SATO, which can be applied to solving social problems,” Izumi said at the news conference. UNICEF and Lixil intend to kick off a program aimed at creating an affordable market for inexpensive toilets in Ethiopia, Tanzania, and Kenya. “The challenge is to go to countries and encourage people to understand the necessity of toilets,” Seto said. He added that the partnership with UNICEF, which will support the role of disseminating such information, will help tremendously. According to the company, about 2.3 billion people around the world lack access to safe and sanitary toilets. Of these, 892 million — almost seven times Japan’s population — are forced to practice open defecation. Every day 800 children under 5 years old die from diarrhea-related diseases due to unclean water or poor sanitary conditions, it said. At the news conference, UNICEF Deputy Executive Director Shanelle Hall emphasized that access to clean toilet facilities directly affects the education of children in low-income countries. “About the half of schools in low income countries lack the sanitary facilities that are crucial for girls and female teachers to manage their menstrual cycle, which leads to higher school dropout rates for adults and girls,” Hall said. 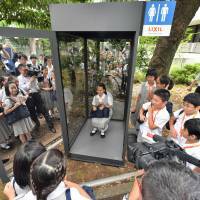 In a special lecture about hygiene held after the news conference, five fourth- and fifth-graders from Showa Elementary School tried using a see-through toilet made out of magic mirrors. 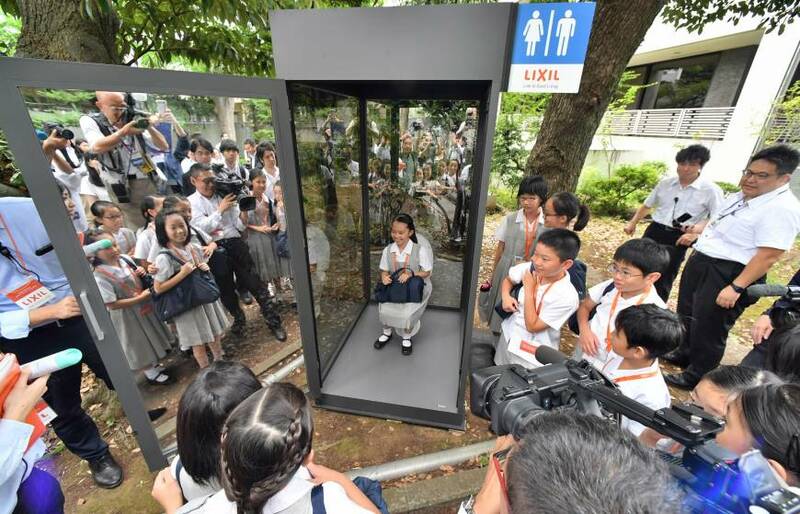 The mirrors prevent people from seeing inside but allow the toilet occupant to see the outside, thus giving them a glimpse of what it is like to be forced to defecate outdoors while surrounded by other people. toilet, UNICEF, sanitation, Lixil Corp.